- Email management. It has the ability to automate and streamline the management of their email. - Project knowledge and the ability to harvest the wealth of project information in archived projects and other projects, even in your own projects. 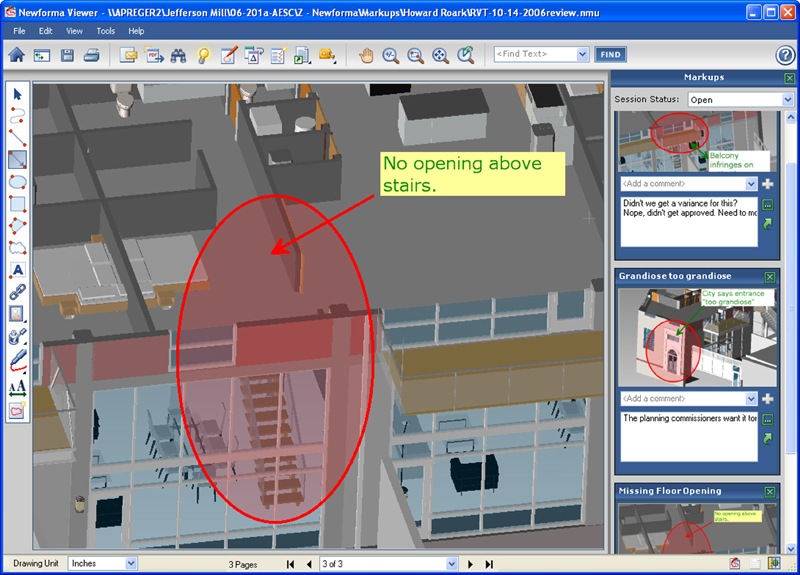 Newforma Project Center software provides workflow to streamline the markup and review of three-dimensional models. The Snapshot tool creates screen captures which Newforma Viewer displays for markup and sharing. Anybody on the project team can easily browse, preview and comment upon the markups. The process provides an audit trail of decisions for a design or submittal review. There’s also search that has been extended to support the intelligent object properties in BIM models so you can now search the hidden object properties in a BIM model. Compare. As you’re moving from milestone to milestone in a BIM environment, you have the ability to compare the upcoming milestone with the previous milestone to catch any unintended changes and to insure that any changes that were intended were properly documented. In May McNeel & Associates held an international gathering about the future of architecture at the Delft Technical University Faculty of Architecture in Delft, the Netherlands. Founder Bob McNeel said that many architects have been using their Rhino 3D modeling software to create sculptural buildings with complex forms. In fact, back when they shipped the first product, the first person who called in with an order was somebody in Frank Gehry’s office with Frank’s credit card number. Coming from the manufacturing and engineering perspective, Rhino naturally leans toward manufacturing in that it creates, analyzes, translates NURBs curves, surfaces and solids in Windows of any complexity or size. 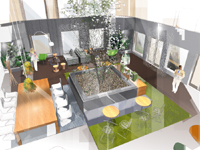 Most architectural products come from the 2D drawing and rendering perspective, according to McNeel. Traditionally 2D software vendors offering 3D architectural modeling software grapple with the issue of “moving” architects to 3D. Architects still have the issue of getting accustomed to modeling in 3D with Rhino, however, the information they gather in the modeling process can be used by the fabricator and others throughout the building process. The Applied Research Group at Bentley takes research to the next level. According to Buddy Cleveland, research has been very much product focused, which makes it subject to product delivery deadlines and schedules, and thus within a short time horizon. Without an exclusive focus, said Cleveland, it’s nearly impossible for the company to distinguish research from product development, difficult to gauge the magnitude of our research investments on the one hand, much less the return on these investments on the other. The Applied Research Group, from a business point of view, is intended to help Bentley increase the visibility of its investments to make sure they are aligned with their business objectives and the customers’ business objectives. The mission will be executed on one project at a time, some will involve internally prototyped development, others will be joint projects with other organizations, technology providers or partners. Examples of types of Applied Research projects include GenerativeComponents (GC,) “an associative design system,” the incorporation of technology into existing Bentley products such as Digital Pen & Paper, licensed from Anoto. This technology incorporates a special pen that accurately captures and stores marks made by that pen, and does it by way of special optics in the pen that can record where that pen is based on a microdot pattern embedded into the paper. The new release of the Piranesi 3D painting tool sports a completely new user interface. Marco Crawford is an architectural technician and long term, established user of Piranesi and MicroGDS, CAD system developed by Informatix. The CAD system is the prime system within the practice he consults for and is used as a full blown CAD environment, but it is also an extremely good modeler and renderer and can export directly to Piranesi in all the file formats. MicroGDS is used to create the models for export to Piranesi. In January, Janet Franke, Nemetschek Deutschland GmbH, Manager Corporate Communications, discussed Nemetschek’s acquisition of Graphisoft shares and what that would mean in the marketplace. According to Franke, Nemetschek has been on a clear growth course again since 2006. “1. With Graphisoft, we will be able to strengthen our market position, particularly in the architecture sector. We are the number one in Europe for AEC software solutions and believe we also have good opportunities for growth outside Europe. Nemetschek now has a customer base of 270,000 active customers all over the world. This article is right on the money. As corroborated by nearly everyone who has a pulse on the industry, such as Patrick McLearney, the Director of the AIA, BIM and sustainability will be the primary drivers of change and transformation of the AECO industry in 2008. In 2007, we made tremendous strides towards strategic BIM standards that will help the operational and tactical level BIM implementation and software creation. Addtionally, visionary software firms are meeting the demand for interoperability and high quality information management. As the NBIMS Testing Team Leader and speaking for the team collectively, we hope all these trends continue into 2008 and beyond. It is important to discuss the details and the methodology to keep the Model updated constantly and routinely during construction and Deliver the Model Electronically at the same time as the Keys are turned over. Final Payment shall not be made to the contractor without delivering the BIM file to the owner. the Model is part of the investment made by the owner for their facility, it will be key for Stewardship of the facility.